Celtic play Aalborg tonight with one of the most uneniviable records in the Champions League. Gordon Strachan’s men have only picked up a single point from a possible 51 in seven barren years in the group stages of Europe’s premier competition. In these 17 games, they’ve never kept a clean sheet. This makes for horrendous reading for Celtic fans and is made all the more incredible considering their outstanding home record, where only four teams have avoided defeat since the formulation of the latest Champions League format. Aalborg is one of those teams. Not only do they have past failures to contend with, but also the possibility that if defeated this will be their last game in Europe for the season. Even if Celtic win this evening, they have to rely on Manchester United beating Villareal in the other fixture to keep the knockout stage dream alive. Strachan was particularly coy at yesterday’s pre-match press conference, where he offered little insight to his selection or tactics for the match. He said: “I like to win football matches, I like to put out a team to play good football and I like to attack, so the side I pick won’t be any different from usual”. 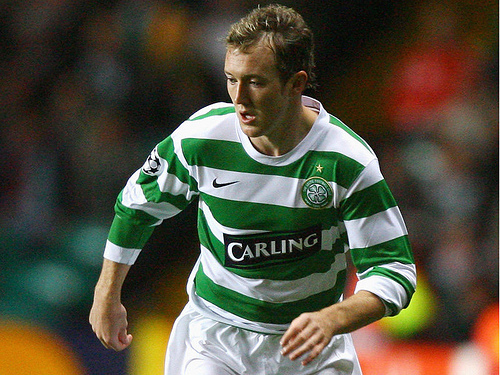 Aiden McGeady, who will no doubt be key to Celtic’s plans tonight, was more open about his confidence. He claimed: “We’ve seen enough of Aalborg to see that we have a better team and it’s a game we should go out and win. “I don’t think Aalborg created a lot of chances and, without going over the top, I thought we should have gone on and won”. Allan Kuhn disagreed with McGeady’s assessment. The manager, who replaced Bruce Rioch at the end of October, tried to insist there was parity between the teams: “They have more international players, but at the moment I don’t think they are a better team than us. “What is good football? To win matches? Celtic will always get results over there but this will be difficult for them because we are at home”. Kuhn seemed to hit the nail on the head of Celtic’s problems, and if he has anything to do with it, it will take quite an effort to overcome the record that plagues their travels. Posted in Sports and tagged Aiden McGeady, Celtic, Football, Gordon Strachan. Bookmark the permalink.